At allChalets we provide 100% financial protection for your payments. We are members of the Travel Trust Association and abide by a strict code of conduct to protect your payments. 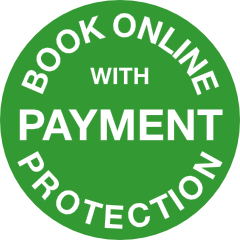 Knowing that we provide payment protection gives you extra peace of mind when booking a chalet rental or ski holiday through the allChalets website. We can't protect your payment if you don't pay through us! Book with confidence. At allChalets we provide 100% financial protection for your payment. To keep your payment safe you must book and pay through the allChalets website using your credit or debit card. If at any stage you are unsure about the level of protection provided or are concerned that an owner, a chalet manager or a third party has requested a payment directly from you then please contact us immediately. REMEMBER: To be covered by our Payment Protection you must make your payments to All Chalets Ltd. This includes both the deposit and balance (if you paid in two installments). If you would like confirmation of the exact protection provided for your holiday please don't hesitate to contact us. IMPORTANT: We can only protect payments made to All Chalets Ltd. If you pay directly to a private owner or third party company, then your payments are not covered by our Payment Protection.